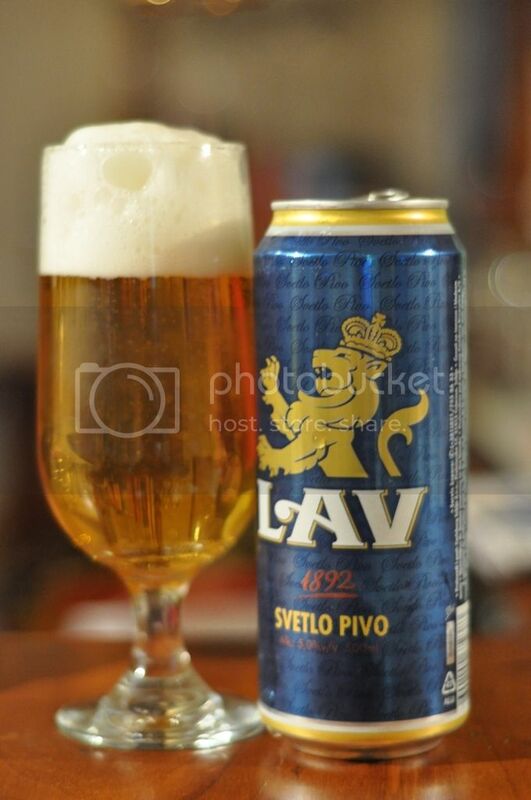 This is I'm pretty sure the first beer I've ever had from Serbia. This seems odd as I have a few Serbian friends and it must be a bad sign that they've never spoken to me about Serbian beer. Oh well, I've made the safe choice and stuck with the Euro Pale Lager, how bad can it be? An excellent pouring beer! If looks could alone decided how good a beer was, you could award this the best beer award. The beer is an excellent golden colour with lots of small bubbles rising to a four finger head that rises above the lip of the glass without overflowing. The head is thick and creamy looking, and it hangs around for ages before settling to a light rim. Absolutely perfect! The smell is quite undistinct. There is a mild grainy smell which is very simple and has a small herbal tone. Hops are more prevalent and again smell herbally, but you can definitely smell the bitterness, I'm not familiar with the hops style but although the smell is weak I believe them to be of high quality. There are also citrus notes but it is not a strong smelling beer. Not offensive in anyway, quite a good smelling just a little weak. I like this beer quite alot, alot like the smell the flavour is quite weak. The hops are lovely and bitter, but I only criticism of them is there are nowhere near enough of them. The carbonation is nowhere near as high as it looked, even though there are still small bubbles rising, it's actually quite low. When you couple this with a very light mouthfeel, it makes for a highly sessionable beer. The finish is slightly strange and leaves a fuzzy feeling in the mouth, which may offend some, but this problem is easily solved by drinking more! Not a great beer but a good easy drinking beer. The strange after drinking feeling is the only thing making me not instantly recommend you going to buy this! I think as Euro Pale Lagers go this is quite a good one, at just over $3 a can, it's certainly worth a try. If JELEN is your favorite beer, you would know that JELEN is not beer from Montenegro, it is from Apatin brewery, Serbia. Yes Jelen's main brewery is in Serbia. In Australia we only get Jelen brewed at Trebjesa Brewry in Montenegro - where they brew Niksicko.